The Film: “Griffin” is a feature-length documentary that explores the art, life and eccentric spark of one of the world’s least known and most influential 20th Century surrealists. 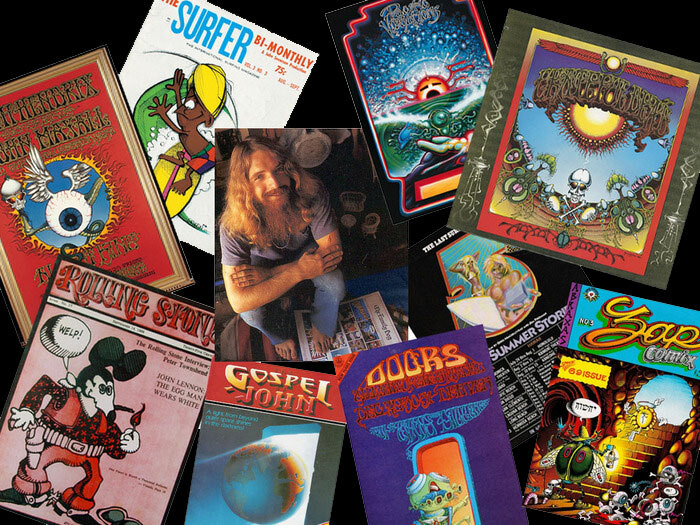 Over the time-warped span of the 1960’s, one-time teen cartoonist Rick Griffin created defining icons for three pillars of west coast counterculture: surfing, psychedelic rock and underground comix. In each of these Ground Zero movements Griffin was considered a visionary savant who masterfully infiltrated his passions and relentless spiritual quest through commercial art…often subverting banal 50s advertising trademarks into mindbending psychedelic mandalas. Griffin cultivated a charismatic, rock-star persona and during his heyday was celebrated in Life Magazine as one of the “Big Five” of psychedelic poster art. Later, a born-again Christian, he would illustrate the Gospel Of John in the vernacular he knew and loved best…the comic-book. But by 35 he was all but forgotten. At 47 he was gone, killed while roaring his Harley down a Northern California back road. But Griffin’s art lives on, his messages and cosmic signposts firmly encoded in our post-modern DNA. Phase One: Getting the Story (Production) From present to mid-2013. Phase One production has been ongoing since early this year to acquire legal rights, archival assets (art, footage, memorabilia), key interviews and to assemble my support group and production crew. A three-person team consisting of myself, a director of photography and a sound engineer will complete interview production within six months. Phase Two: Crafting the story (Post-Production) Mid to late 2013. Editing, HD transfers, music acquisition, animation, sound mix, color grading and final output for theatrical and broadcast release. Phase Three: Sharing the story (Distribution) Early 2014 The film’s premiere is planned for early 2014 followed by scheduled mix of film festivals, DVDs, video on demand and cable TV. The Team and Resources: This film has the full cooperation and support of Ida Griffin and the Griffin Estate. That means access to rare archival photos, footage and memorabilia as well as Ida’s invaluable memories and perspective. Beyond that I’ve enlisted an advisory board of influential Griffin aficionados from within the surfing and entertainment industries to assist me with all facets of story, production, media and marketing. These include: Greg Escalante, co-founder Juxtapoz Magazine; Steve Pezman, publisher of The Surfer’s Journal, Doug Pray, award-winning filmmaker (Surfwise, Art and Copy), Drew Kampion (author and former Surfer editor) and John Clark (lead animator at Sony Studios).